IF YOU NOTICE HAIR LOSS, VISIT YOUR DOCTOR FOR A DIAGNOSIS … THE SOONER HAIR LOSS TREATMENT BEGINS, THE BETTER THE RESULTS. He further explains that Alopecia falls in between specialties. Hair is part of the skin so it is included in dermatology. Yet the cause of the most common form, Androgenic Alopecia, is internal; a result of the actions of hormones which are the focus of a different specialty — endocrinology. You may need to visit many doctors to get to the root of your problem! Since you don’t know why you are losing your hair you need to visit a doctor for a proper diagnosis because your hair loss may be treatable and reversible like hormone imbalances, side effects to medications, scalp and follicle infections, stress and nutritional deficiencies. Is your hair just ‘thinner’? Is your hairline receding or different in some way? Do you have any bald spots or patches that appeared recently ? Does thinning or hair loss run in your family? Obviously if you’re having a problem with hair thinning, get to your hairstylist first. There are some routine and normal reasons for thinning and hair loss in both men and women. Your hairstylist can identify those stemming from improper use of styling tools or too much styling product build-up on the scalp and can teach you how to avoid and solve the problem. If you notice marked signs of hair loss, a general rule of thumb would be to head straight to your physician and a dermatologist to rule out any scalp and serious systemic health issues advises the National Alopecia Areata Foundation . 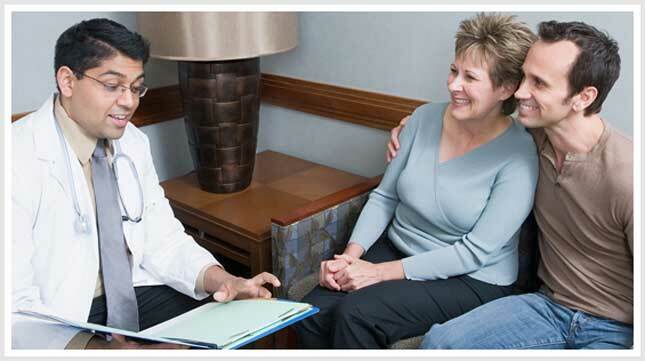 If you get no satisfaction, your doctor may refer you further to an endocrinologist or other specialist. But only your doctor can help diagnose whether your condition is serious and treatable. There are many other simple reasons aside from hair follicle diseases that you may find your hair thinning or falling out from that can be resolved by your doctor and successfully treated. According to a recent article by Dr. Howard Levy, an internal medicine specialist at Johns Hopkins, the main causes of thinning hair for both men and women are hormonal abnormalities, local trauma, medications, stress, scalp inflammation, and normal age variation. Your doctor may ask you about your diet, your lifestyle, medications you are taking and how you are feeling in general to determine your overall health and any other clues to your hair loss. Blood tests will also identify specific causes of hair loss. Depending upon the diagnosis, most hair follicle problems are reversible and treatable with medication. And when the diagnosis is simple, your hair loss can be totally reversible and treatable. If the results are more complicated your doctor may refer you to further specialists for treatment including support groups. “First of all don’t call it a wig,” cautions Shelly Beatty, owner of Stylemakers Salon in Fort Worth, Texas who deals extensively in medical hair loss issues for her clients. “The medical term for it is ‘Cranial Prosthesis’ and you’ll need your doctor to write a prescription for it.” Many insurance companies that cover prostheses of any kind will also cover a medically necessary wig for those who experience total hair loss due to medical reasons, she advises. Once you have the prescription, you can work with your hairstylist to determine what your insurance will pay for and decide on a type of wig or treatment that fits the parameters. You may find that your hair loss is perfectly normal and nothing to worry about or that you have a follicle infection or that it’s something more serious. But at least you’ll be on the right path to doing something about it!